Last night was "Kelly and Emily's night of fun"
Thank you for all of your wonderful suggestions and ideas! We started off with the staple of all good slumber parties - pizza. Emily likes a little pizza and a LOT of ranch dressing. Then we moved on to doing chalk drawings on our back patio. This was probably Emily's favorite activity. 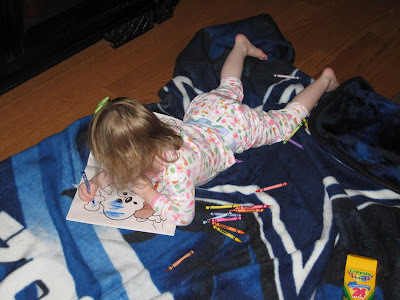 I finally got her to go to sleep last night by promising her we would draw outside in the morning if she would sleep good. Then we watched a Barbie Princess movie while we held our princess blanket. It's great to be a girl. We colored with Color Magic Markers. Those are a blessing - no mess!!!! Of course - we played dress up. Emily was VERY good while she was with us. She didn't cry - she was very happy. She doesn't sleep much but she went to sleep around 10 and didn't wake up until 7. She and I slept together in the guest room. I had to keep checking her to see if she was still breathing because she was so still. We had such a fun time with her. Dawson even did pretty good with her. He was pretty sweet and patient. He's pretty worn out right now. It's raining and is supposed to the rest of the weekend so I plan to get lots of rest. All of you moms of toddlers - it is a hard job. I told Laurie that having two had to be really hard. I can't imagine more than that. It's the best job in the world but it's one of the hardest too. Scott and I got a little glimpse of how much our lives are about to change. Love the picture of Scott drawing on the patio floor!! There will be plenty of that and more when your little girl/boy arrives! Only more than just one night!!!!! Get your rest NOW while you can!! You and Scott are doing to do great with your little one! I am new to your blog, so Hello !! It looks like you had a wonderful time. She is too cute!!!! I love the dress up pic. Looks like you two had a great time!!! Hope you are having a good weekend! I'm glad you guys had so much fun. She is a little doll! I knew that you would have fun. It looks like she enjoyed herself. Love the jeans a raxorback shirt, I think I wear that about once or twice a week. Pizza, cookies and sidewalk chalk... Sounds like my kind of slumber party! ;) Glad y'all had a good time! The dress up picture is my favorite!! ooooooooooooooohhhhhhhhhhhhhhhhhhhhhhhhhhhhhhhhhhh praise GOD FOR THE CHANGE THAT IS ABOUT TO HAPPEN!!!!!!!! !HOW YOUR CUPS WILL OVERFLOW!!!!!!! GIRL GET ME SOOOOOOO SIDE WALK CHALK.......THAT LOOKS LIKE A BLAST!!!!!!! YALL ARE GOING TO BE SUCH GREAT PARENTS.......I CAN'T WAIT FOR THE SWEET PHOTOS OF YOUR NEW FAMILY ALL TOGETHER!!!!!!! LOVE YOU FRIEND!!!!!! So fun!!!! 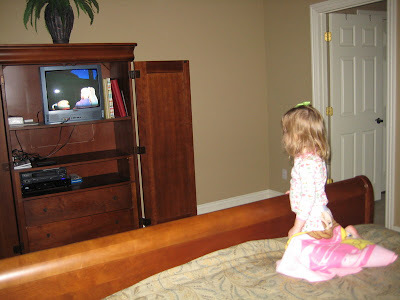 One day she will blog about how she loved going to her Aunt Kelly's house!!! all this time I've been entering my blog address as I've left comments, not knowing I had to enter the "http://" part too! I had no idea I wasn't linking my name to my blog! Emily is going to be bored now that she's home! Being a parent of a toddler IS hard work, but God also is smart enough to start with them as infants, and work your way into toddler-hood, tweenagers, and finally the teen years. You'll absolutely LOVE every age. PS - Love the jeans! That was a perfect slumber party!! You are going to be such a great mommy! Get all the sleep and rest you can right now!! Sounds like you had a great time. You need ya a little girl!! Were you using the color wonder markers? The ones that supposedly only show up on the special paper? 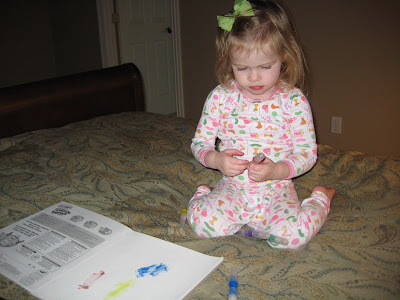 If so..let me tell you..years ago, my daughter was in our bed..on our yellow comforter, using these markers. She left one open on the bed..I noticed a spot, washed it and then there was a BIG pink stain on the yellow comforter..so beware!! That age is so much fun. Looks like a slumber party that Ceci and I would have! Awww... It looks like fun. Having a toddler is hard work, but lots of fun too. My favorite saying I hard recently was - The days are long, but the years are short. So true! Now that I'm a mom I have a ton of respect and admiration for single moms. I don't know how they do it without "Relief" coming in at the end of the day! What a wonderful day (and night) of fun! That is awsome... I love playing with my niece, it's like being a kid again with not a worry in the world, just fun and make beleive! I am glad you did this with Emily, I am sure it was a big treat for her!!!! How fun! Emily looks like she is having a ball in those pics! And I am all about some sidewalk chalk. That stuff is where it's at. You are going to be such a good mommy!!! How great! Looks like you girls had a fun night. 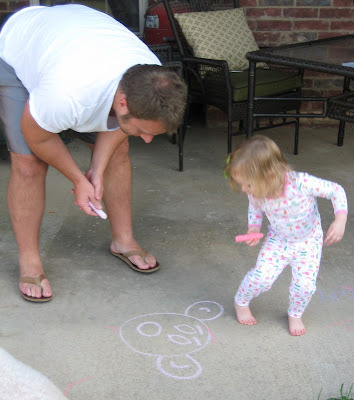 Chalk drawing is one of my favorites too...can't wait for Mabry to get a bit bigger so we can do that. It looks like everyone had a fun time. Emily is such a doll. You & your husband look like true naturals! I know you will both be awesome parents. :-) God is amazing....isn't He? Looks like ya'll really had a fun time! 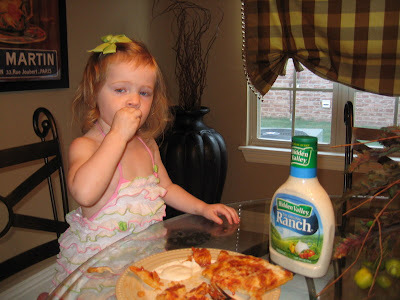 My little Emma loves her some Ranch Dressing, too. Anything's better dipped in a little Ranch! I know that you and Scott are going to be awesome parents! Sounds like a perfect night for a little girl. I'm with you...I think I could color in Ella Grace's coloring books by myself, too. Glad your had fun. You look like a natural at sidewalk chalk. Looks like a fun time was had by all! Isn't great how kids make the time fun! Have a great day! 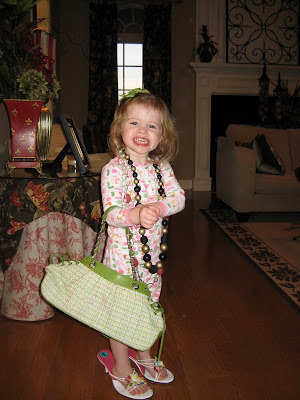 I love the pic of Emily playing dressup! It is so funthat you kept her for a night! You guys are going to be great parents! How sweet! It looks like you had a blast! What a fabulous slumber party!!! You did all the things any girl would love to do ;)! 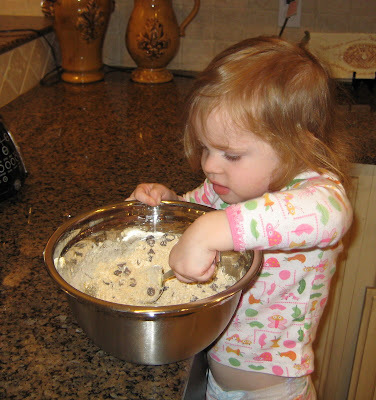 I love the picture of Emily stirring the cookie dough!!! Can't wait to see pics of your family ;)!!!!!!!!!!!! I knew you guys would have a blast!! That age is just so much fun! Yay-you made cookies! :) And you even went all out the old fashioned way. You are going to be such a great mommy!! I know she had a great time with you guys. Ooh, I knew you'd have fun! See, you did great. You're going to be a wonderful mom!! !